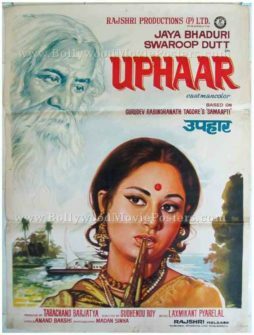 Beautiful hand painted old Bollywood movie poster of the memorable Hindi film Uphaar (1971) for sale. 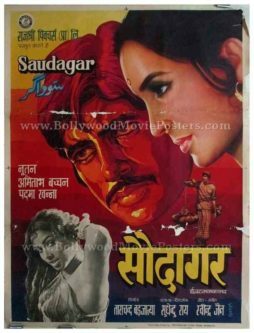 This is an actual surviving poster of the Jaya Bhaduri Bachchan starer that was nominated for the Best Foreign Language Film at the 45th Academy Awards. Printed and circulated somewhere during the release of the film, this beautiful hand drawn old Bollywood movie poster was originally designed for publicity of the film but never ended up being used. The poster features a stunning portrait of the lead actress Jaya Bhaduri Bachchan, with a God-like figure of India’s greatest Nobel prize winning poet, writer and philosopher, Rabindranath Tagore in the background. Uphaar is a 1971 Hindi film released under the banner of India’s leading production house, Rajshri Productions. The film stars Jaya Bhaduri Bachchan, Swarup Dutt and Kamini Kaushal. Uphaar is basically an adaption of a short story named ‘Samapti’ (The End) by India’s most iconic writer, Rabindranath Tagore. The film was selected as the Indian entry for the Best Foreign Language Film at the 45th Academy Awards but was not accepted as a nominee.